This is not as difficult or dangerous as it might sound. All you need is a laser printer, a hot iron, a bucket, and the (quite cheap) Sodium persulfate acid. You can easily buy the latter online in most electronics online shops. Try different kinds of paper, some are much better than others. Try different laser printers; some print much sharper than others (maybe depends on age, or make? Don’t know). Be sure to select “crop / keep scale” when printing, otherwise your components won’t fit! Don’t forget to print mirrored. Apply a lot of pressure to the hot iron, that seems to be more important than the temperature. If the toner is blended on the board, then either the paper is bad or the temperature is too high. When done with removing the paper from the board, make the board very hot again for a while. That way the toner will stick to the board better. It significantly improves the result for me. You don’t need to be that careful when removing the paper; I found it to not matter much if there’s paper left on the toner-filled areas. Just make sure to remove it where the copper is still visible. Having the acid cold and still will not only cause the edging process to take ages, but also significantly deteriorate the quality of the result. You can either use a warm water bath and stir, or — what I find very convenient and what worked very well for me — put a hair-dryer over the bath, which will both heat and stir it simulataneously (the stirring only works if your bath is very shallow, but it usually is). Make sure you dispose of the acid professionally, since there’s copper in it, you must not just pour it away. I want to try removing the copper by electrolysis, but I currently don’t have the necessary platin wire. Add filled areas to your board and connect them to ground; this not only improves the electrical behaviour of your circuit, but also saves you a lot of acid, pollution, and time. If you follow this advice, then etching boards with 0.1mm wide tracks should be no problem using this laser-printer method. The tracks on the board above are 0.2mm wide. For designing boards, there’s several tools available; I used kicad, but I can’t really compare it to others (since I didn’t use anything else yet). It’s quite full-featured, but its GUI could need improvements in several corners. 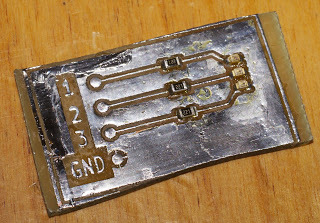 For soldering the board, I used the pre-heater mentioned above. It basically just blows hot air out of a hole, and you can put your board on top of that. 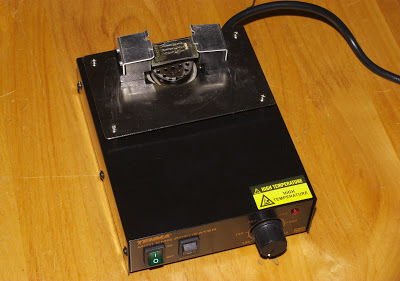 It allows to select temperatures as high as 350°C, which is more than enough to melt solder. In practice, a temperature of little more than 250°C turned out to be best. 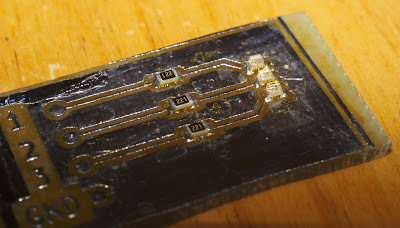 Ordinary 60-40 solder melts at a lower temperature, but consider that the air blowout temperature is not going to be the same as the temperature on the upper side of the board. It obviously doesn’t do anything useful, it’s just a test board with three LEDs.